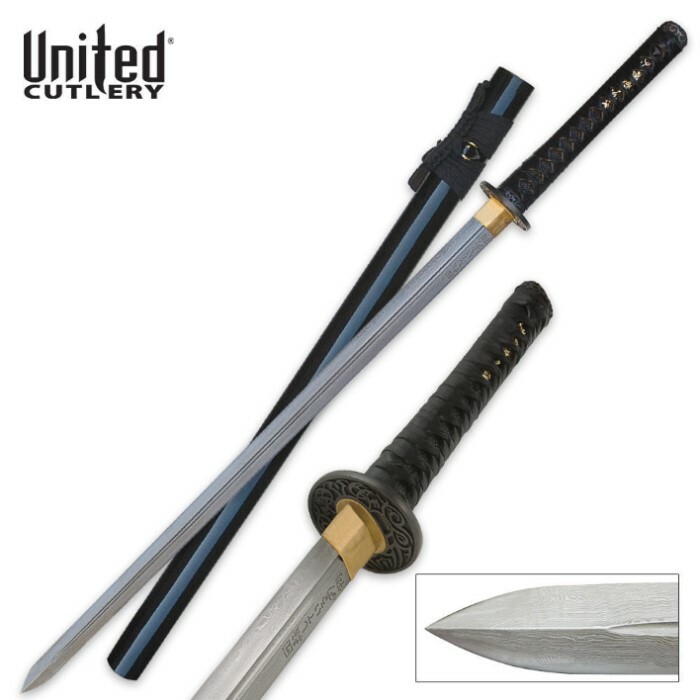 United Cutlery Black Ikazuchi Forged Damascus Katana | BUDK.com - Knives & Swords At The Lowest Prices! United Cutlery's heat-forged Black Ikazuchi Damascus Katana embodies the distinctive style of ancient Samurai warrior katana swords. The double-edged blade is meticulously folded nine times to 1792 layers of powerful, striking Damascus steel. A cast decorative guard and brass menuki complete the design of the cord-wrapped genuine ray skin handle. The laser etching translates to "United Strong Steel." This is quite a nice looking blade with good craftmanship involved in its construction. Its comfortable in the hands and very, very light. The lightness in the blade is part of the major problem that I have with this sword because it is incredibly easy to bend and it will NOT spring back into place at all. Im afraid to slice or stab into anything remotely hard because it could seriously warp the blade. Not at all functional in any sort of practical means. A very nice display piece only that wont fall apart on you like most other piece of crap swords you can buy. Just don't expect this thing to stand up to any sort of abuse.